Inflatable Hair Washing Shampoo Basin from HealthyKin.com is so simple, fast and comfortable it's head and shoulders above the rest. The unique inflatable basin fills the need for an easy, refreshing shampoo for patients confined to bed. 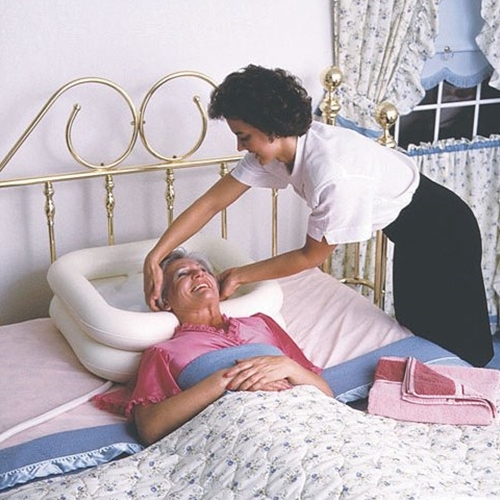 When inflated by mouth or air pump, it is a secure, form fitting basin that comfortably cushions the patient's neck and shoulders. A conventional drain hose efficiently removes soap suds and water from the basin. All that's required for cleanup is to towel dry the rinsed out sink, deflate, and fold up for prompt storage in a space as small as a folded towel. This is a Godsend! Hairwashing at home was not possible. Dry shampoo sprays were our only option and these were wreaking havoc with her scalp. She is usually nervous a afraid about trying new things, with this she lay back and enjoyed her shampoo. I highly recommend this to everyone. The bed stays totally dry. I do however have 2 small improvement suggestions 1. Make the drain outlet bigger... its a little hard to get it to drain because its such a small hole. 2. Find a way to soften the edges where the neck goes as they are pretty hard. I actually put thick fleecy socks on both sides to stop the edges causing skin tears. But still an excellent item. it's very helpful in our situation and I'm happy with the product. Definitely recommend to have it. A great solution for someone bed bound or in a wheelchair. Easy to use, and more comfortable for the patient than using a tray at the sink. This product is very well made and we are happy with it. The basin proved to be very helpful. Your inflatable basin works great. It makes Washing my wife's hair so easy. I only have one suggestion. See if there is anything that can be done about the seam at the space for the neck. It can cause irritation for the skin. All in all a great product. A beautician recommended this product to me so that our caregiver could use it to wash my wife's hair in bed. Both, the caregiver and my wife love it. We have used this several times to wash my Mom's hair. It's great!! works great a lot easier than trying to get her up. I'm a caregiver and use it on one of my clients. Works great. I'm glad I bought it.